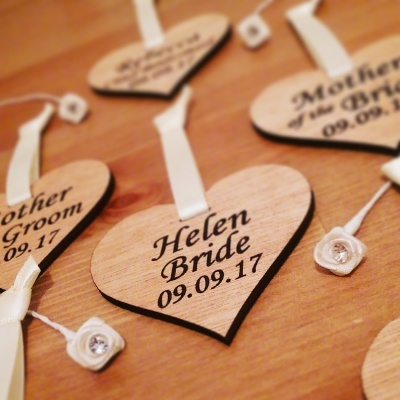 ​Personalised hearts to hang on each of your Wedding parties hangers at the start of your special day, to attach to gift bags or as beautiful keepsakes for all those close to you as a special Thank you for sharing your day. ​Each is personalised with a name/relationship to the Bride and Groom and the date of your wedding. ​Hung on 1cm silk ribbon in a choice of colours.